Has brand advertising become more valuable? Thinking of real estate primarily as a lost classified category may cause sales teams to overlook opportunities to sell brand ads to agents while the market is red hot. New platforms from WeHaa and iPublish have automated some or all of the work, allowing newspapers to profitably sell multimedia options at a compelling price point. 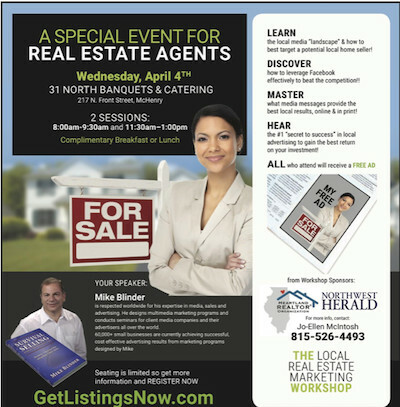 These geo-targeted agent ads can be used like postcards as a way for agents to farm the neighborhood. Unlike the advertising for buyers, which is search driven, advertising for listings is a function of local branding, something media companies are good at selling. The opportunity was noticed by The Blinder Group, which runs in-market sales drives based on appointments and workshops. When it tallied 5,000 sales calls from 2017, real estate showed up in the top six categories (in case you are wondering, the other categories were individual health care providers such as dentists, cosmetic doctors and chiropractors, auto aftermarket, home improvement, especially with green options, legal and financial services). His reasoning is compelling. In 2018, North American real estate is a ‘sellers market,’ with agents battling for coveted listings, rather than looking for buyers. A hot job market means millennials are starting to make money and combining incomes; interest rates are creeping up adding a fear factor to the urgency of home purchasing and stock markets, even with recent declines, have added capital to buyers’ portfolios. So the real challenge for agents today, Blinder says, is getting the listing. “Agents who spend money with Zillow, Trulia and Realtor.com, have told me they think they are being ‘held hostage’ ... (in order to) please sellers,” Blinder said. But those sites do little to help agents find listings. Blinder now sells markets real estate ads via a platform by Wehaa. Agents buy a display ad with a landing page that shows their photo, listings and contact form. The content is pulled in automatically from the agent´s websit, and the agent receives each new lead by text. An integration with Facebook also allows an upsell to a Facebook carousel page, and includes targeting a neighborhood. The business model is a monthly wholesale fee for each ad, which are sold on annual contracts. The newspaper doubles or triples the price from from Wehaa´s cost of $99 per month per online campaign per month, and $250 per month per social campaign. Wehaa uses about half of the $250 wholesale fee to purchase targeted ads. Blinder, who started selling the packages in 2018 on annual programs, says he has an 85% close rate from set appointments. At Pamplin Newspaper Group, realtors are getting as many as 150 clicks. One realtor had 150 clicks without any listings, and four phone calls from homeowners wanting to sell. iPublish Media, the leading provider of self serve platforms, als offers a fully automated DIY platform for real estate brokers. The Bay Area News Group created LeadHax, its own branded version of the platform in 2016, (see this early case study on the technology). The sales front end is an elegant DIY funnel, so agents can place orders themselves in a few clicks. Marketing is typically by email, with an extra push from pitching the product at brokers´marketing meetings. BANG reported that brokers were happy to help, since the agents paid for their own marketing. The business model is also slightly different, as there is one charge per month for unlmited use of the platform, rather than a wholesale/retail price per campaign sold. The fullfilment on Facebook is also fully automated. Leadhax also offers discounts to a variety of major realtors and is partnered with other newspapers who want to use the brand. Either way, these ways to sell real estate marketing are creating expanded opportunities for local publishers.